Nearly 1,000 years ago, in the ornate capital of Heian-kyo, there was a young, fair-skinned man of noble birth by the name of Abe no Yasunari, who was also a diviner. His foe was Tamamo no Mae. She was a bewitching magical fox who deceived the hearts of men. Time passed. Places changed. Now, the decisive day approaches at the splendid, renowned fortress known as the Castle of the White Heron. At times with grace, at times mysteriously, this revue of a Japanese tale depicts the fate of the diviner and the magical fox, in conflict and drawn to each other over the course of reincarnations spanning a millennium. While Leonardo da Vinci is celebrated as an all-around genius, there is still much about his life that remains unknown. One theory is that the inspiration for his creations was his love for a woman. This production depicts the affection and hatred between da Vinci and the figures in his life. The story is set in 15th-century Florence, Italy. Lorenzo de Medici rules over the city-state in this era and fuels a flourishing of Renaissance art. He is an exceptionally skilled military strategist and statesman whose relationship with the Pope is growing increasingly antagonistic. De Medici has given his patronage to a young Leonardo da Vinci as an artist. While completing the works requested of him, da Vinci is also busy indulging himself in projects commissioned by others, which draws the irritation of de Medici. It is at this time that da Vinci learns that de Medici's lover is Caterina, his childhood friend. The two grew up as illegitimate children who stuck together and understood the loneliness felt by the other. Now Caterina has grown into a beautiful lady, but da Vinci sees in her eyes an enigmatic smile that seems to shield her true feelings from view. Final performance for Fuuma Kakeru, Hanasaki Airi, Asahina Aoi, and Maihana Miria. Due to an injury, top musumeyaku Hoshikaze Madoka did not perform in scene 23 "Finale F" from 10/05 - 10/15. Her role in this scene was performed by Yumeshiro Aya. 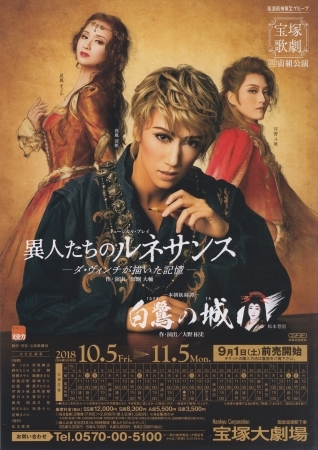 † Due to an injury, Anon Yuusei was absent for the entire run, including the shinjin kouen. Her role of Leonardo as a boy during the shinko was performed by Mashiro Yuuki. Created by lokai. Last Modification: Monday 25 of February, 2019 05:29:46 PST by caithion.